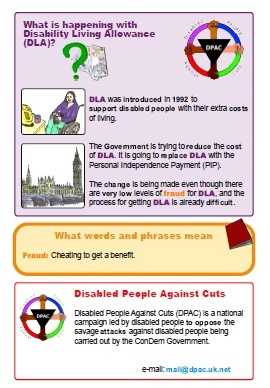 What is happening with Disability Living Allowances (DLA)? 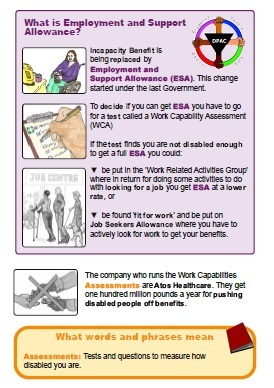 What is Employment and Support Allowance? 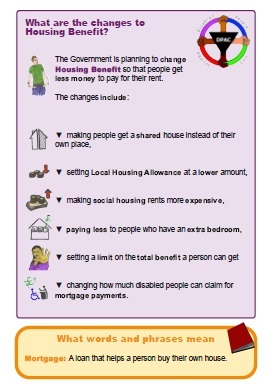 What are the changes to Housing Benefits? 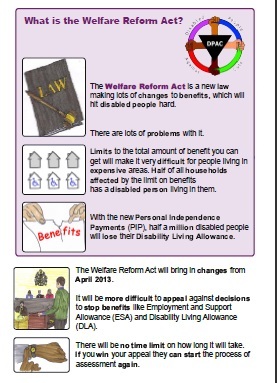 What is Welfare Reform Act? What is happening to the Independent Living Fund? Click here to download these easy read factsheets about what is happening to the Independent Living Fund. 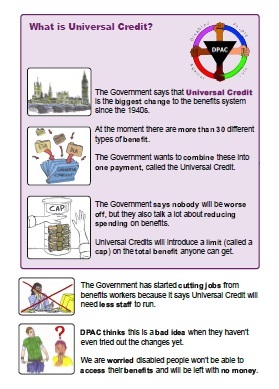 A Tale of Two Models Disabled People vs Unum, Atos, Government and Disability Charities by Debbie Jolly. This article on the two models of disability is crucial reading as according to Lord Freud, Government Spokesperson, Department for Work and Pensions the government has ‘gone for the biopsychosocial model' of disability, which explains disability in terms of biological, psychological, and social factors, rather than the social model advocated by disabled people. 'The Austerity War and the impoverishment of disabled people' by Chris Edwards. This finds the burden of the cuts to public services is being unfairly shouldered by some of the poorest people in society. Commissioned by Norfolk Coalition of Disabled People (NCODP) the report says the poorest 20% of the 2.7 million households receiving disability benefits will lose 16% of their cash income, plus benefits-in-kind, during the four years up to 2015. Visit the Public Law Project for lots of good comments about legal action.